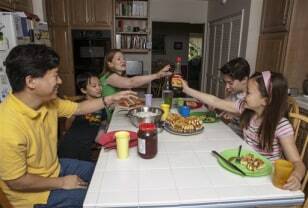 In this photo taken Tuesday, Aug. 14, David Oh, a flight director of NASA's latest Mars mission, far left and his family have breakfast at 3 pm at their home in La Canada Flintridge, Calif. The Oh family has been living on Mars time and following an odd schedule ever since the NASA rover Curiosity landed in an ancient Martian crater on Aug. 5. Siting from left: David, Devyn, his wife Bryn, Braden, and Ashlyn.